For the second time this week, Chelsea had to play through most of the game with ten men. 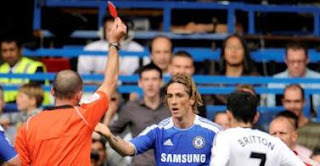 Fernando Torres will get all the headlines, for his sending off more than the world class finish that put the Blues ahead. Ramires was electric in midfield, scoring twice and almost sealing a hat-trick. And it was Didier Drogba that came on, with minutes remaining, and wrapped things up with an excellent finish. It was not the return to Stamford Bridge that Brendan Rodgers had dreamed of, but for Andre Villas-Boas it was a satisfying professional performance from his side (but five without a clean sheet) and one which sees the Blues move to within three points of top-of-the-table Manchester City. Villas-Boas handed Fernando Torres a start after he scored in the defeat to Manchester United, while Drogba was confined to the substitutes' bench along with Frank Lampard. Swansea have not won away at Chelsea since 1925 but the visitors almost made a great start in just the seventh minute. Scott Sinclair hurtled down the left and pace and cut into the box, only for Branislav Ivanovic to make an impeccable challenge at the back to halt the attack. Torres was convinced that he had won a penalty in the 27th minute as he surged into the Swansea box, only to go down under a challenge from Garry Monk as he latched on to John Obi Mikel's through ball, but referee Mike Dean was not remotely impressed. Two minutes later Torres took down an exquisite ball from Juan Mata before lashing a clinical finish beyond Michel Vorm to open the scoring and silence his critics. Chelsea were suddenly bristling with confidence in the final third of the field, and Ramires made it two as Ashley Cole slid an inviting delivery beyond a static Swansea defence for the Brazilian to drive a low shot under Vorm. Just as it seemed the hosts would cruise through the match with a comfortable two-goal lead already established, Torres had a shocking surge of blood to the head as he flew in with two feet on Gower. The challenge saw referee Dean immediately brandish the red card, and there were very few complaints. The visitors flew out of the blocks at the start of the second half, and Nathan Dyer came close as he fired from the edge of the box, with his effort taking a deflection only to dip onto the roof of the net. Chelsea were almost punished for slack marking in the 55th minute as Ashley Williams ghosted into the box unmarked to power a downward header on target, only for Ramires to clear off the line. Both sides made changes as Danny Graham replaced Leroy Lita in attack for Swansea, while Villas-Boas hauled off Mata with Florent Malouda getting half an hour to make his mark. Chelsea refused to be dictated to, despite being reduced to ten men, and Nicolas Anelka unleashed a rasping strike from range as the ball thundered off the crossbar with Vorm comprehensively beaten. Cole very nearly made it three as Chelsea looked to put the game beyond doubt, but he could only slam his effort wide of the far post after Ramires put him through. Ramires turned finisher as Jose Bosingwa assumed the role of provider in the 77th minute as the Brazilian zipped into the Swansea box with the visitors' advances upfield leaving them exposed, and the finish was crisp and clinical. There was still time for Williams to capitalise on some shoddy marking from Chelsea to arrive at the back post and head home from Mark Gower's cross. The afternoon was capped off for Chelsea as Drogba made his return and promptly scored in the final seconds with a well taken finish. Unused subs Turnbull, David Luiz, Lampard, Kalou.